If you are visiting Bangka Island, you should drop by in Perlang Village. It is located in Koba District. What is in there? It is the home of a mesmerizing Sadab Koba Waterfall. The location is about 7 km from Pangkal Pinang. Here is the thing. 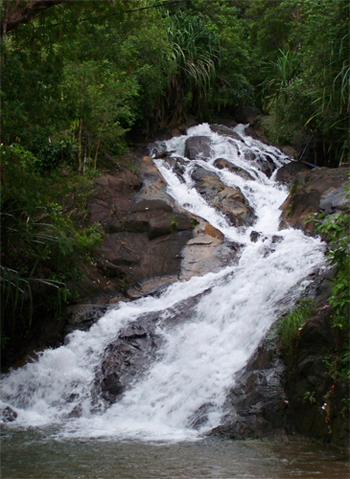 The waterfall is situated in the midst of wilderness. That means you should conduct a little bit trekking to reach it. The terrain is challenging! During your adventure, you may pass through many farms and a settlement. The water debt is moderate. Sadab Koba Waterfall is considered safe for tourists. Everyone can enjoy the water and play in it. It isn’t quite tall either. You can even climb on the rocks and reach the top of the falls. It is quite slippery, though. Make sure you watch your steps. Sadab Koba also features some plants. These make a more refreshing nuance. What is the most popular spot? It is the pond. Visitors are allowed to play and swim in it. No worries. The water is shallow. Koba district is the home of numerous nature tourist spots. One of them is Sadab Koba Waterfall. It is located in in Perlang Village. It is similar to Gunung Maras Waterfall. Both of them are located near to a highland. In order to reach the falls, visitors must involve a little bit of trekking. It takes an extra awareness, as well. Along the way to the waterfall, you may encounter some farmer’s cottages. The roofs are ornamented by sago palm leaves. You can use these cottages for resting, actually. Visitors can park their vehicle near to those cottages, as well. From here, you are going to perform hiking. The waterfall is situated in a secluded spot. Once you hear the splash of water, you are getting closer to the falls. This sensation replenishes your tiredness instantly. The water flows freely from above to the pond below. The angle is about 45 degree. The falls has the width about 3 m. When it comes to the length, it is about 6 meters. In terms of appearance, Sadab Koba Waterfall looks gorgeous. In holidays, this location is crowded by local people. Some of them come from Pangkal Pinang or other districts, though. It is because they are interested in the serene nuance of Sadab Falls. Once you have arrived in such beautiful spot, it is the time to enjoy the water. The pond is vast and it is safe for bathing. Not to mention the water is quite refreshing. Your final destination is Perlang Village. It belongs to Koba District. From Pangkal Pinang City, the trip takes about 1 hour and 40 minutes. The distance is 80.8 km. Once you have arrived at Sadap Village, you should continue your trip to the beach. Along the way, you can see green trees and beautiful landmark. There is also an ancient mining site. That means you have been already close to the waterfall!